Literature in the 16th century was still the province of a happy few, the movable type printing press was only a recent invention. 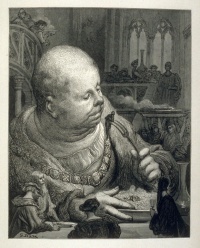 Important books include Gargantua and Pantagruel by Rabelais, In Praise of Folly by Erasmus, the anonymously published Lazarillo de Tormes and Heptameron by the Marguerite de Navarre. Medieval romances were reduced to cheap and abrupt plots resembling modern comic books. Neither were the first collections of novels necessarily prestigious projects. They appeared with an enormous variety from folk tales over jests to stories told by Boccaccio and Chaucer, now venerable authors. A more prestigious market of romances developed in the 16th century, with multi-volume works aiming at an audience which would subscribe to this production. The criticism levelled against romances by Chaucer's pilgrims grew in response both to the trivialisations and to the extended multi-volume "romances". Romances like the Amadis de Gaula led their readers into dream worlds of knighthood and fed them with ideals of a past no one could revitalise, or so the critics complained. Italian authors like Machiavelli were among those who brought the novel into a new format: while it remained a story of intrigue, ending in a surprising point, the observations were now much finer: how did the protagonists manage their intrigue? How did they keep their secrets, what did they do when others threatened to discover them? Curiosities included Hermaphroditus, Book of Kisses, Portrait of Lozana: The Lusty Andalusian Woman and The Book of the Prick. Unless indicated otherwise, the text in this article is either based on Wikipedia article "16th century in literature" or another language Wikipedia page thereof used under the terms of the GNU Free Documentation License; or on original research by Jahsonic and friends. See Art and Popular Culture's copyright notice. This page was last modified 23:42, 18 January 2010. This page has been accessed 5,713 times.